ARTIFACT: This is a rare World War II Consolidated Vultee Air Transport Command jacket patch. This patch came to us with some other items from the estate of Wally Johnson, an ATC radio operator (pictured above). Please click on the links at the bottom of this page to see what else belonged to Mr. Johnson (sold separately). 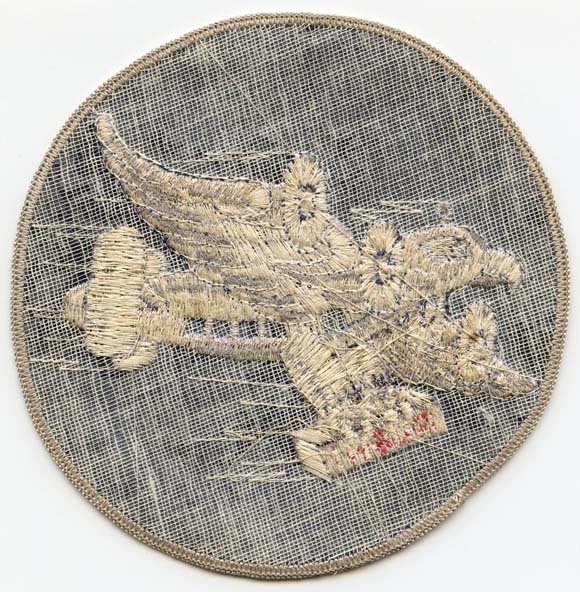 The patch shows an aircraft with an eagle�s head and wings whizzing by with the message RUSH! SIZE: Approximately 4-15/16� in diameter. CONSTRUCTION/MATERIALS: Twill embroidered in cotton/silk threads, mesh backing. CONDITION: 8- (Very Fine-Excellent-): The patch shows some light wear only. Rare WWII ATC Flight Radio Operator Wing Worn by Wally Johnson - Rarest of ATC Half Wings!